You know how when you were growing up and the cool thing to do was to have a fern? Remember begging your mom and dad to buy you one and when they finally caved in and did it, you got too busy with other stuff and ignored the fern until it began to wilt? And then once you noticed the fern was starting to wilt, you just gave it a bunch of plant food and doused it with water to catch up for what you missed when you were too busy. What I’m getting at is that this blog has been my childhood fern. I got crazy busy in April and the first part of May and am now giving it a bunch of information to catch people up on what we are doing. 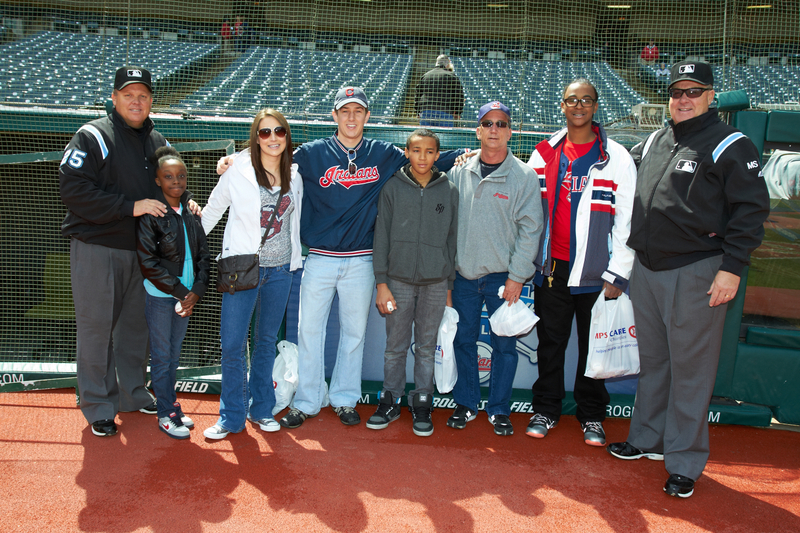 UMPS CARE Charities–a couple of times a year, the Cleveland Indians team up with Major League Baseball and its umpires to bring in a select group of kids that get to meet the umpires prior to a game. The kids can ask the umpires questions, get their autographs and take a few pictures while down on the warning track behind homeplate. who are battling life-threatening illness. Indians’ pitcher Justin Masterson stopped by to talk to the family and offer some words of support and Indians outfield Shin-Soo Choo also stopped by to take some photos and signed and gave the family the bat he used for batting practice that day. 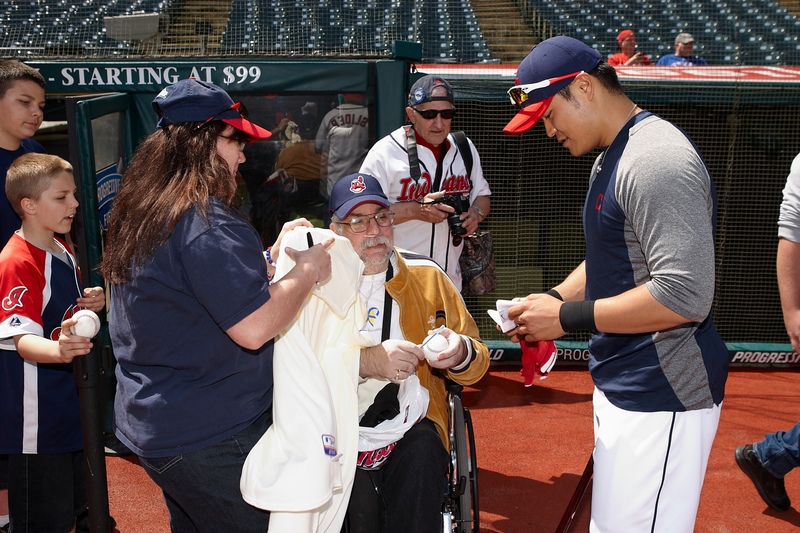 Tribe Reporter for a Day–The Cleveland Indians and The Plain Dealer partnered once again for their annual Tribe Reporter for a Day event on May 9. 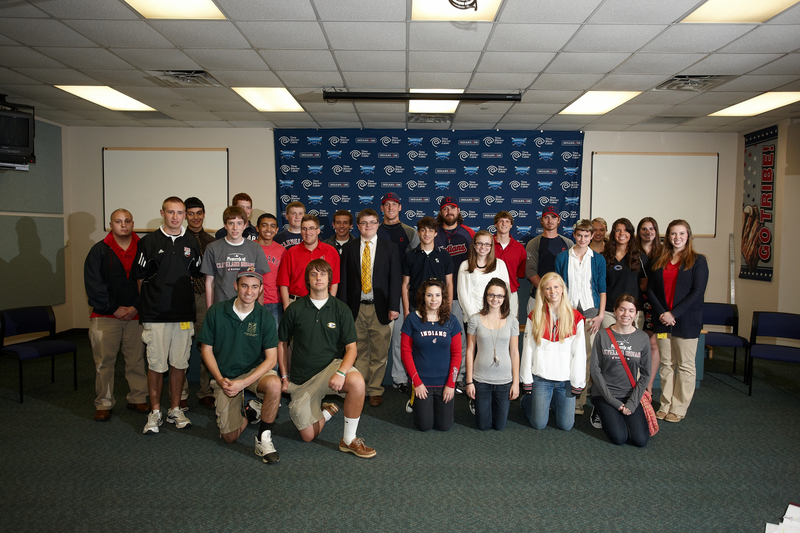 The event allows 25 local, aspiring, high school journalists to come down to Progressive Field and experience a ‘day in the life of a sports reporter.’ The young journalists started their afternoon by visiting the Indians Social Suite and talking with the Assistant Director of Communications for the Cleveland Indians, then made their way down to the Press Interview Room to sit in on Manny Acta’s press conference. After the conference, Manny hung around to let the students ask him a few questions. From here, they spoke with The Plain Dealer’s sports writer Paul Hoynes who gave them valuable tips and words of wisdom in regards to sports writing. The event was capped with the reporters’ very own press conference with Indians pitchers Chris Perez, Nick Hagadone and Josh Tomlin. The journalists even had an assignment given to them with a deadline! They had to write about their experience and submit it to The Plain Dealer by the very next day! All in all, it has been a productive April and early May. We’ve got our Cleveland Indians Charities Friday night auction coming up on May 18, followed by our Wives Association’s Tribe Treasure auction on May 19. Gotta keep my fern alive, so more posts to come in the near future! To all of my avid followers, you’ll remember a while ago I wrote an entry called “Bic It, Masterson” (keep scrolling down through the entries and you’ll find it). I spoke of how Cleveland Indians Charities and the Wives Association held an auction where the players’ wives/girlfriends donated something of their husband/boyfriend that was a little different from normal auction items. Chris Perez and his wife donated a 30 minute pitching lesson, the LaPorta’s donated a breakfast at a restaurant with them and the Masterson’s offered up the opportunity to have Justin Masterson shave someone’s head! Getting to know Justin a little bit more this year, I’ve come to understand how perfect this auction item fits him. The guy loves people’s heads! He’ll just go up to them during meet and greets and rub their head. There was one kid at an event who had a nice afro and Justin–while holding his baby daughter–walked up to the kid and had his daughter poke and rub the hair. The rest of the day, as soon as she would get close to the hair she would reach for it and want to play with it. For a guy who shaves his head, he definitely loves playing with hair. Oddly enough, it wasn’t even his idea to have this as the auction item. The idea came from his wife, Meryl, asking Facebook fans what the item should be and the head shaving idea won…leading to the main purpose behind today’s blog. Our winner, after a few months of waiting, was finally ready to have his head shaved. 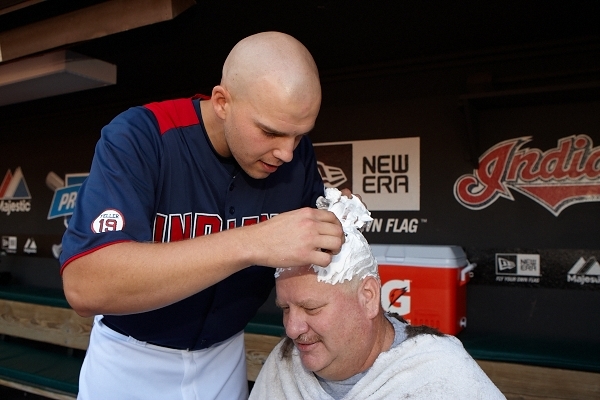 The shaving took place in the Indians dugout prior to the team taking batting practice. Justin was ready with clippers, towels, shaving cream and a few razors. He took his time and enjoyed it making sure it was a nice, smooth shave. Although we were all waiting for it, no skin was cut during the shave. Justin cleaned off the freshly shaved scalp with water, put on some aftershave and stood back to smile at his work. Back in my days as a Berkshire Badger (high school and mascot) cross-country runner, my team used to do some crazy stuff with our hair. Partially to psyche out the competition, partially because we were ranked 2nd in the state, a little because we had nothing better to do, but mostly because we looked freakin’ sweet when we did it. We had anything from mohawks one year, to long hair the next and even shaving our heads for our conference championship (which we won). When I say we shaved our heads…we shaved them down to the skin. Bic it, is what we called it, because we would use a Bic razor to get that nice, close shave. If I ever find a picture of us, I’ll post it up here–but don’t hold your breath. As with all of my blog entries, the opening paragraph eventually leads into what I need to promote for Indians in the Community. This entry is no different. Probably the coolest and most unusual thing (in my opinion) comes from Justin Masterson’s wife. She is auctioning off the opportunity to have Justin Masterson shave your head in the home dugout before a game. I’m expecting him to Bic it. If you aren’t into having your head shaved by a professional baseball player, and don’t enjoy breakfast with two strangers, or wearing some other guy’s cleats…there are still other great items to bid on. Or you can take your chances on the Mystery Ball fundraiser. For $40, you can reach in and get a wrapped up baseball autographed by one of the players on the Indians team. You won’t know what you are getting until you pay for it and open it up (hence the “mystery”). All monies raised will go to charity. The auction will begin at 5:30 and will in section 153 up until the 7th inning. So make your way down there and put some bids on these wicked cool items. If you don’t want to bid, you can always just chat it up with the wives! See you there and GO TRIBE! !